History says construction workers, who worked on the bridge in the late 1930s, nicknamed the bridge ‘Galloping Gertie’ for the upward movement the bridge made. This would be the same movement that caused the bridge to collapse only 4 months after it opened in July of 1940 due to a high wind storm. It would take 10 years before the bridge was replaced, mainly due to the US involvement in WWII. But, good things did come from this incident. It spurred a series of studies and research technology which is still use to this day. In 2007, the second bridge was completed (the picture you see before you) and has helped ease increasing traffic flows and cargo traffic. If you’re traveling eastbound, you will have to pay a $4.00 toll (cash or charge), but if you have the “Good to Go” pass, your toll is reduced to $2.75. For more information, check out the Tacoma Narrows Bridge tolling page. Also, if you’d like to read more on the history of the bridge, check out the Tacoma Narrows Bridge Wikipedia Page. Historical known for its boat building, fishing, and logging, Gig Harbor is home to around 6,500 residents. When we arrived, we couldn’t help but notice its historical charm and attraction. Before you head to Gig Harbor, you should check out The Gig Harbor Guide. It will tell you everything you need to know about where to stay, eat, and play. They’re also very helpful in suggesting places to visit while you’re in town. 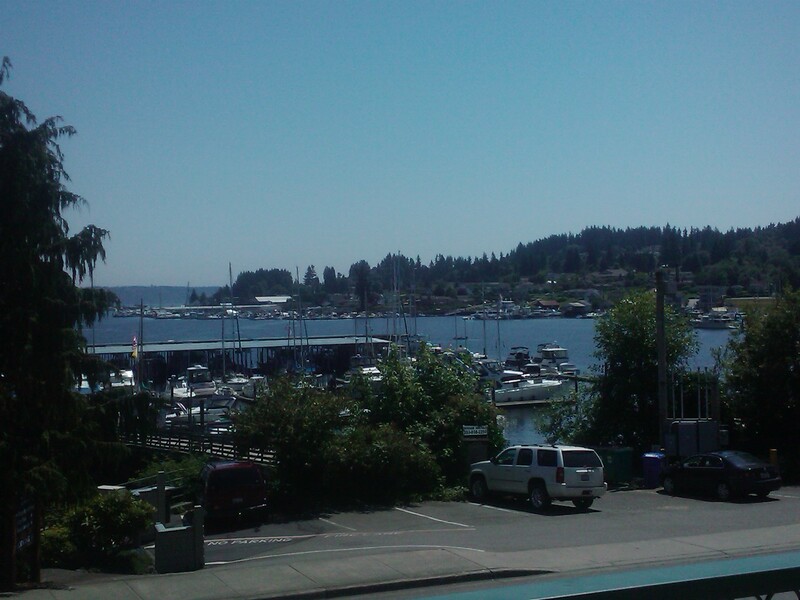 Our first stop was the Harbor History Museum to see the official site of the Gig Harbor Wine and Food Festival. Unfortunately, they weren’t open to the public yet and are currently under construction for their September 18th grand opening. So we made our way to our next destination. I was really impressed by their diverse selection of wines from around the world, including a surprising selection of wines from Greece and Croatia. I met with one of the workers at the wine shop and he told me a little about the wine shop and the history of the town. One of the things we learned was some of the early settlers of Gig Harbor were from Croatia and Norway and wine was a natural fit for the city. After looking around for a bit, I decided to purchase a few bottles from different regions around the world. If that wasn’t enough, Water to Wine also offers daily wine tastings so you can try out various wines before you buy them. A great feature for wine drinkers on any level. If you’d like to learn more about Water to Wine and its many offerings, you can visit their website. After buying a few wine bottles at Water to Wine, we went next door to visit Morso Wine Bar. Morso is the latest in high quality restaurant offerings Gig Harbor has to offer and is one of the many participants in the Gig Harbor Wine & Food Festival. Their focus is on the customer creating their own food and wine experience by enjoying various small plates of food and pairing them with great wines from the bar. We spoke with general manager Kristin Wells who told us a little about the restaurant and the creative genius behind it. Morso is mostly open from 5PM – 10PM, but they’re in the process of opening up for lunch time. Although we haven’t had a chance to eat there, I do suggest you check it out and experience their concept for yourself. After looking at their menu, I will definitely be back. In another blog entry, I will share my experience with you. On our way back to the central part of the city, we stopped off at the Gig Harbor Farmers Market in Skansie Brothers Park to check out the happenings there. The Gig Harbor Farmers Market is open every Wednesday, Saturday, and Sunday in three separate locations: Skansie Brothers Park (Wednesday), Kimball Drive Park and Ride (Saturday), and O’Callohan’s Pub & Grill (Sunday). The hot item of the day was raspberries from a local farm. The quality was second to none and we were unfortunately stuck out of luck when we learned they were sold out for the day. But I did pick up some nice flowers for Kara and bought a very nice onion for myself. Here are pictures of other items that we saw that day. They also had a very unique marine exhibit too. Check out this craziness! When all the fine dining is closed, Spiro’s came to the rescue. If you want something reasonably priced for Italian food, I would definitely suggest Spiro’s. While Kara had the Chicken Chop Chop Salad, I had the Spiro’s Special (the picture above). This pizza had a surprisingly light crust on the bottom that was very flavorful with a load of toppings in the middle: Pepperoni, Canadian Bacon, Mushroom, Black Olive & Green Pepper. They also have a nice selection of pastas that I was looking to try. Our final stop in Gig Harbor was The Wine Studio. We met with the owner, Diana Beck (another participant in the wine & food festival), who guided us through a nice wine tasting of 6 wines across the board (which I’ll tell you about in a future blog entry). The Wine Studio specializes in value wines from around the world. They offer wine tastings twice a week and every Wednesday night is ladies night. Ladies enjoy a special tasting and 10% off bottle purchases. The Wine Studio is another wine shop I suggest you check out if you’re ever in Gig Harbor, especially if you’re looking for a good value wine. Now that you’ve heard a little bit about the town, let me tell you about the inaugural festival. The festival will feature great culinary talent like Fabio Viviani from Top Chef 5 and Craig Haslebacher who defeated Bobby Flay on Iron Chef America. These two will battle it out in a cook off. There will be book signings from some very notable authors, like Joe Piscatella. Lots of great food will be on display from fine restaurants like Morso Wine Bar (who I mentioned earlier), Brix 25○, and more. And who could forget, the wine! One of my favorite wineries, Camarderie Cellars will be there along with Delille Cellars, Obelisco Estate Wines, my good friends at DiStefano Winery and many more. This event is jammed packed with all sorts of cooking demos, great food, beer & wine, and so much more. I really hope you have the opportunity to attend this year. It’s definitely setup to be a great festival. After the event, I’ll share my festival experience, tell you more about the town, and give my final review and thoughts. Until then, I will see you at the festival!